Bespocut is providing you with the opportunity to become a part of their mission to provide the best bespoke lifestyle experiences. 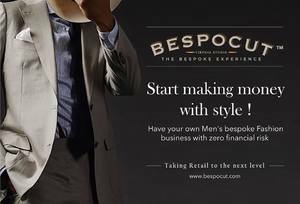 If you are a Fashion Designer and want to become an Entrepreneur than you should join Bespocut, It E-Procurement platform who procure international fabrics, linings, shoulder pads and accessories which used in making of a perfect bespoke suit. You don't need to store anything, they will provide the samples. Work will be done by sample only. The Order can place on their website and it will deliver in the next day. Create your Bespoke suiting Brand!